When someone clicks the Contact Us button in the side menu, fills out the form and clicks Submit, it emails the information to team administrators selected by you. You can change who receives these as follows. Click the Contact Us Recipients tab. Only Email/Print/Calendar Admin and above accounts will appear here. If you want to add someone not listed, go into Account/Member Admin, edit their account, and set their Admin Level to anything other than Not an admin. 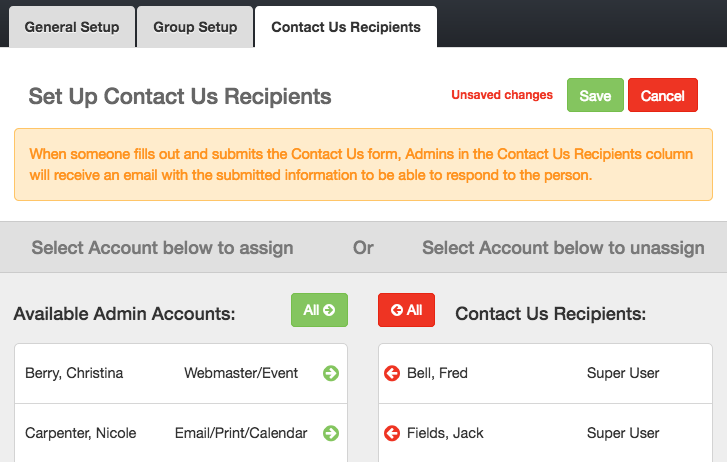 Click the green arrow by a name to move them to the Contact Us Recipients list. They will start receiving Contact Us emails. Click the red arrow by a name to remove them from the Contact Us Recipients list. They will no longer receive Contact Us emails. The All buttons will move everyone in a list to the other list. 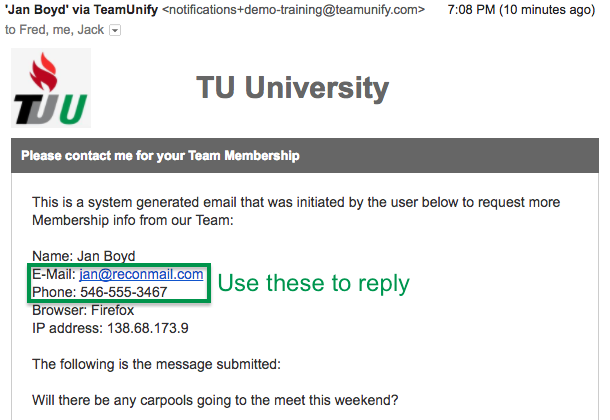 When designated recipients receive a Contact Us email, they cannot click their email program's reply button since the email gets sent from TeamUnify's servers. They will need to either click or copy the user's email in the message to reply to them, or call them with the number in the message. Note that if you need to contact TeamUnify Support, you need to go to System > Help & Training > Contact Support, or click the red question mark in the lower right corner of your site. The Contact Us button on your team’s website are for team parents and members to contact you, the site administrators. You are the "Us!" TeamUnify Support does not receive those emails. Note as well that when people fill out the form it may create an account under the status of "Contact Request." See the below related article.